Zion Market Research has published a new report titled “Spinal Implants and Surgical Devices Market by Product (Spinal Fusion Devices, Non-Fusion Devices, Vertebral Compression Fracture Treatment Devices, Spinal Bone Stimulators, Spine Biologics, and Spinal Decompression Devices), by Type of Surgery (Open Spine Surgery and Minimally Invasive Spine Surgery), and by End-User (Hospitals and Orthopedic Centers, and Ambulatory Surgical Centers): Global Industry Perspective, Comprehensive Analysis, and Forecast, 2017–2024”. 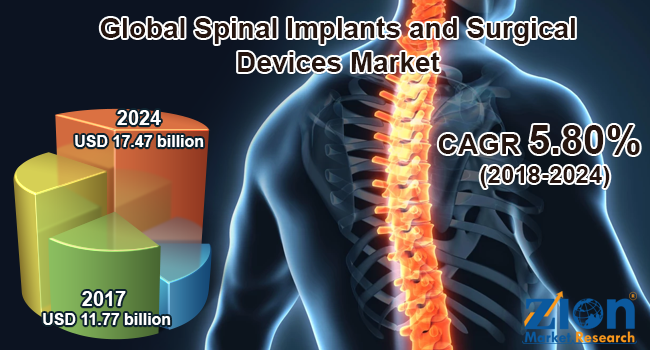 According to the report, the global spinal implants and surgical devices market was valued at approximately USD 11.77 billion in 2017 and is expected to generate revenue of around USD 17.47 billion by the end of 2024, growing at a CAGR of around 5.80% between 2018 and 2024. Spinal implants and surgical devices are used to treat various spinal disorders and deformities, including isthmic spinal stenosis and spondylolisthesis. The rise in the incidences of spinal deformities, increase in the awareness about the use of spinal implants, and rise in the adoption of minimally invasive spine surgeries are anticipated to fuel the expansion of the spinal implants and surgical devices market. Spinal implants and surgical devices market is segmented based on product, type of surgery, and end-user. Based on product, this market is segmented into spine biologics, spinal fusion devices, VCF (vertebral compression fracture) treatment devices, spinal bone stimulators, non-fusion devices, and spinal decompression devices. Spinal fusion devices are further sub-segmented into thoracolumbar fixation devices, interbody fusion devices, and cervical fixation devices. Lumbar plates, pedicle screws, rods, hooks, and others segment comprise the thoracolumbar fixation devices segment. Interbody fusion devices segment includes bone and non-bone fusion devices. Hook fixation systems, anterior cervical plates, screws, and others comprise the cervical fixation devices segment. Non-fusion devices segment includes dynamic stabilization devices, artificial discs, nuclear disc prostheses, and annulus repair devices. VCF treatment devices are further sub-segmented into vertebroplasty devices and balloon kyphoplasty devices. The spinal bones stimulators segment includes invasive and non-invasive spine bone stimulators. The spine biologics segment is further sub-segmented into bone graft substitutes, bone graft, and bone marrow aspirate therapy. The spinal fusion devices segment is likely to dominate the market, due to the increase in the use of fusion devices to align the spine and reduce pain. By type of surgery, the spinal implants and surgical devices market is bifurcated into minimally invasive spine surgery and open spine surgery. The minimally invasive spine surgery segment is dominating the market due to the increase in awareness and demand for minimally invasive surgeries by the patients. By end-user, the spinal implants and surgical devices market include hospitals, orthopedic centers, and ambulatory surgical centers. The hospital segment is likely to dominate the market, due to the presence of a large patient pool in hospitals and the use of technologically advanced products. Europe, Latin America, Asia Pacific, North America, and the Middle East and Africa are the regional segments of the global market for spinal implants and surgical devices. North America is anticipated to dominate the market in the forecast time period, due to the increasing demand for minimally invasive spine surgeries, growing geriatric and obese population, and rising prevalence of spinal diseases and disorders. The rapidly increasing in awareness about the use of spinal implants and devices and the growing investment made for spinal implants are fueling the expansion of the European spinal implants and surgical devices market. In the forecast period, Asia Pacific is likely to show the highest CAGR, owing to the improvements made in the reimbursement policies for spinal surgeries, growth in awareness, use of new technologies, and the presence of a large patient pool. Latin American and the Middle Eastern and African markets are expected to show a slow growth rate in the forecast period. The rising occurrence of spinal disorders and deformities due to the rise in the aging population, obese people, and accidents and increase in the healthcare expenditure are likely to fuel this market’s development in this region.